Staircase is one of the most important structures of the building. Stairs functional. No stairs - anywhere, literally and figuratively! Of course, we are talking primarily about the house instead of the apartment where the stairs, however, is also always possible. 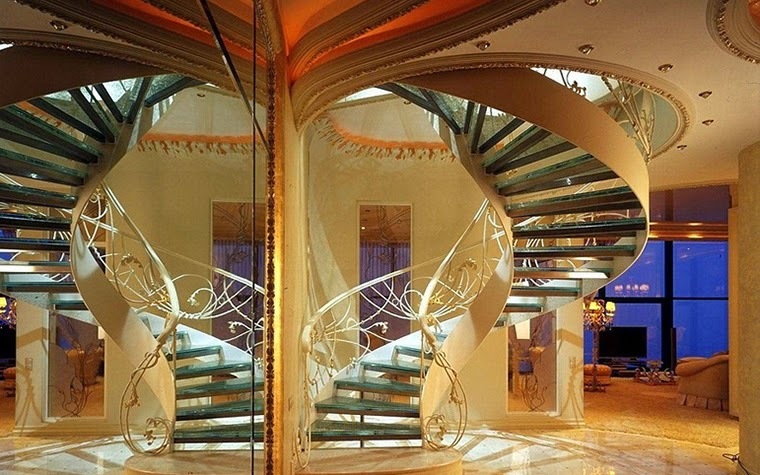 Staircase design in the interior can be quite diverse. The stairs are not only functional but also very effective. She always seems to hang in the air. She is always ready to become the center of interior composition.Stairs can be a screw. The spiral staircase is appropriate not only in cramped and narrow interiors, but in the spacious rooms. Stairs can be cantilevered in which one edge of the stage in the main wall is fixed, and the second as if hanging in the air. (Also very impressive!) Stairs can also be direct; line rotated 90 degrees; direct rotated by 180 degrees. A lot of options. The material is also unlimited in its diversity. You can choose the classic wooden design, forged, glass, ceramic design, and so on. It all depends on the style of the interior and your budget. Do not forget about the right lighting. Decor staircase railing and deep orange color of the walls, complex shades, make this a very simple front stairs. A spiral staircase in the high-tech style combines metal, plastic and wood. Dissimilar materials are very appropriate for this original design. This turning staircase leading to the second floor, also made up of wood and metal. Wood predominates. Equipped with two tiers of windows living room light and transparent staircase with wrought iron railings. Railing rhyme with decor fireplace and grill mezzanines. Stairs in the Art Nouveau style with flowing lines and complex shapes and combines wood, stone and metal. Very nice styling. 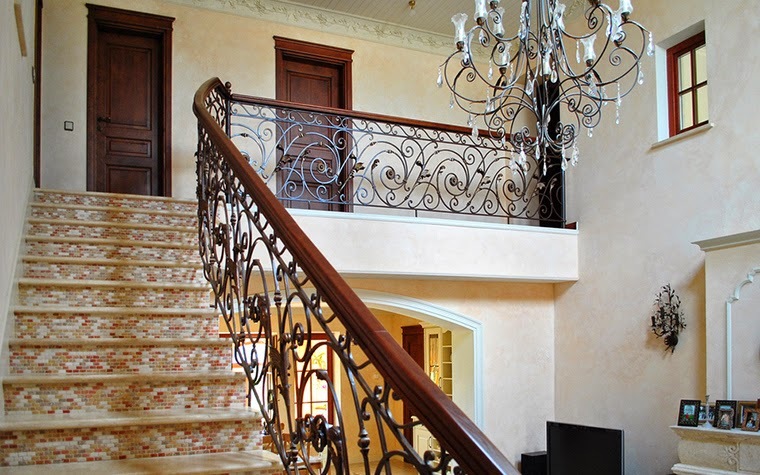 Wooden staircase with wrought iron openwork lattices became apparent center of the composition of this hall. Direct turning 90 degrees modern staircase also like the whole black and white interior. Symmetry between the two spiral staircases - homage to Art Nouveau! 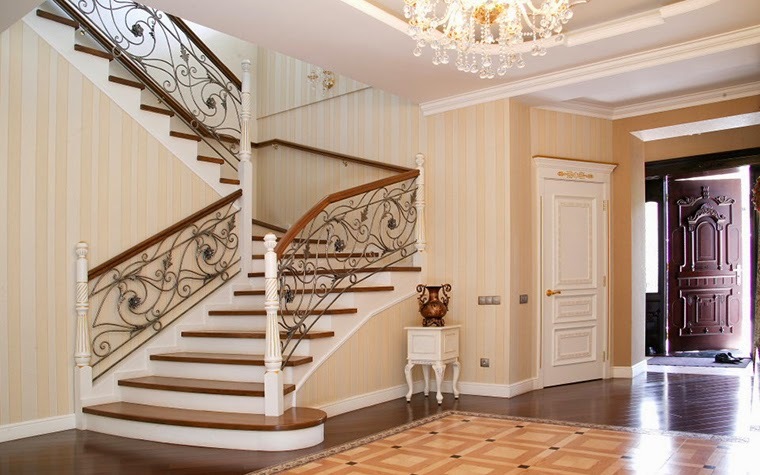 Modern Classic and requires the same classical staircase simple and complex at the same time. 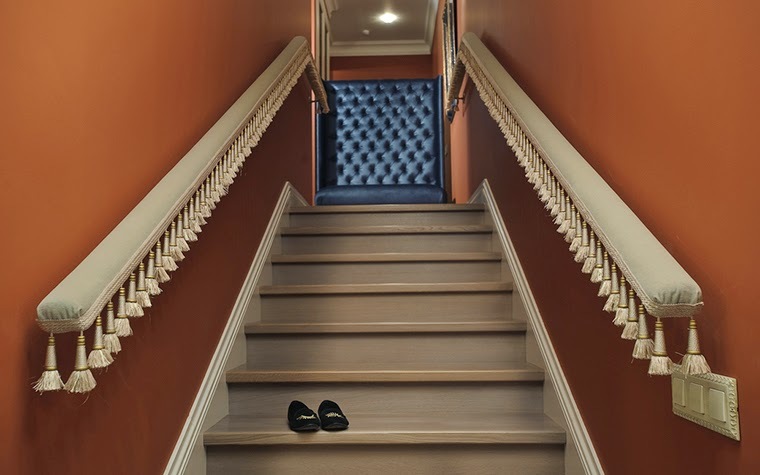 This staircase is made in the classic style of the last century. Curved chandelier - chandelier exacerbates experience. 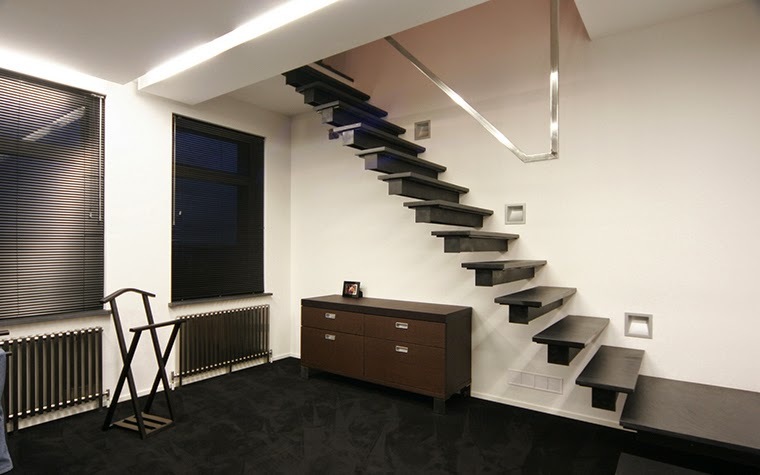 Black and white minimalist of this project, naturally extends to the stairs. 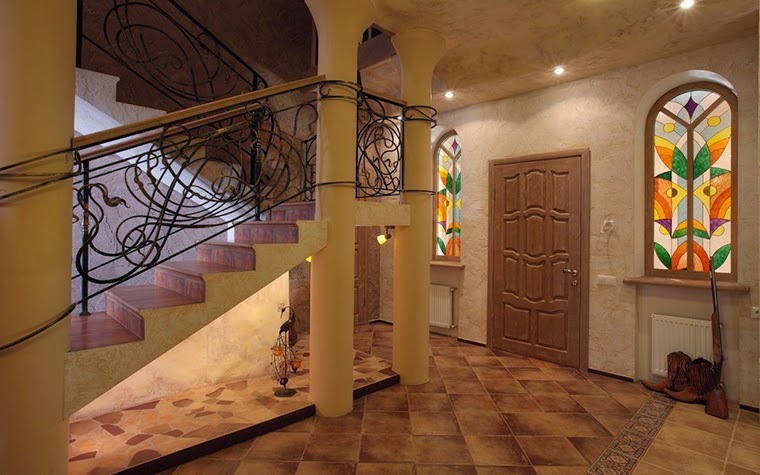 concrete stairs with metal handrails, Columns, wrought railings, stained glass windows .